There’s more to choosing an espresso cup than you might think. 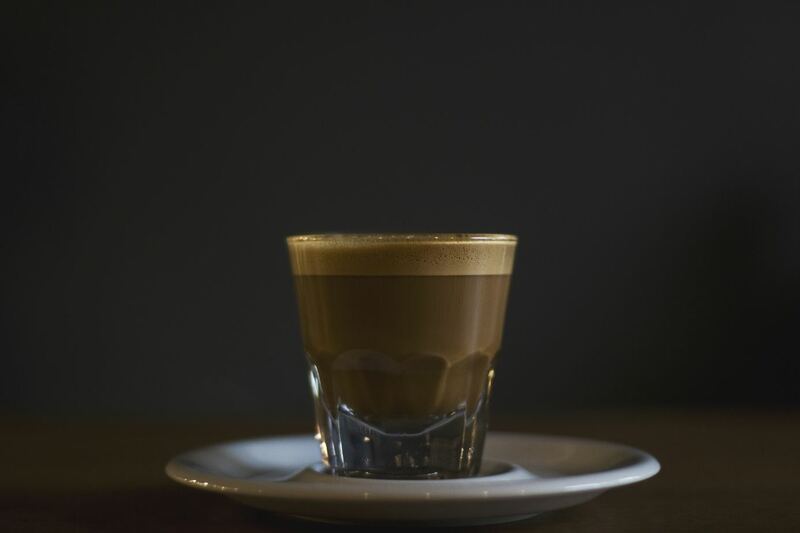 Now, you may be happy to drink your shot from any small cup that you have on hand, but to many dedicated bean-heads, espresso drinking is a ritual. Heck, many caffeine addicts actually have a favorite, go-to cup that they simply must use or their cup of Joe just doesn’t taste the same. That’s great until the dishwasher (or your housemate) breaks your cup. Where on earth do you start looking for a replacement? 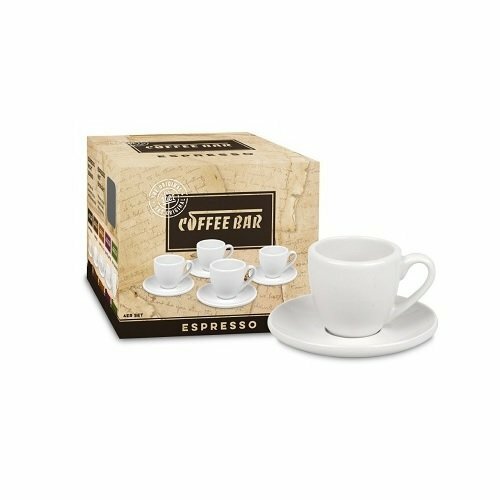 Well, if the worst should happen, or if you just want to invest in a set of espresso cups for your guests when you’re entertaining, we’re here to help you choose the best demitasse that the current market has to offer. Before we get to the nitty-gritty of demitasse product reviews, let’s talk about the conundrum of choosing a suitable vessel for the dark brown nectar. … when it comes to your demitasse. An espresso cup is more correctly called a “demitasse.” Demitasse simply means “half-cup” in French, and it typically holds between 2 and 3-fluid ounces of liquid. A doppio normale (that’s Italian), refers to a cup that holds about 2-fluid ounces of liquid. A lungo (large) doppio takes up to 3-fluid ounces. Thus, if you like to drink a larger brew, go for the doppio lungo option. If you prefer the standard size cup, the normale will suit you fine. 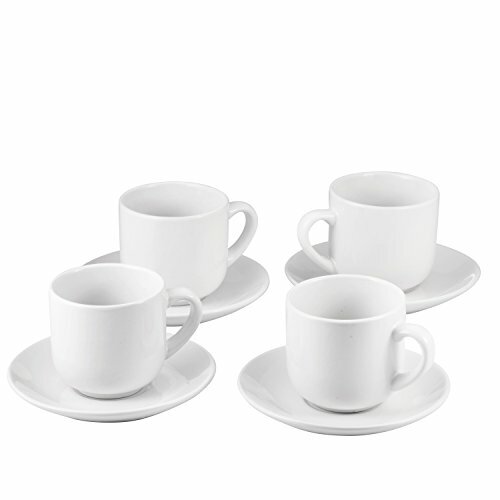 This set of four demitasses and saucers are the kind that you find in most European cafés and coffee shops. These cups are designed to hold a doppio normale, and the saucers will comfortably accommodate a coffee spoon and a couple of sugar cubes. Made from microwave and dishwasher-safe porcelain, these cups are elegant in their simplicity. Less is more; plain white, no logos, no fancy patterns. Just classically stylish espresso cups. Bruntmor’s offering is a basic four-cup demitasse set that comes with saucers. 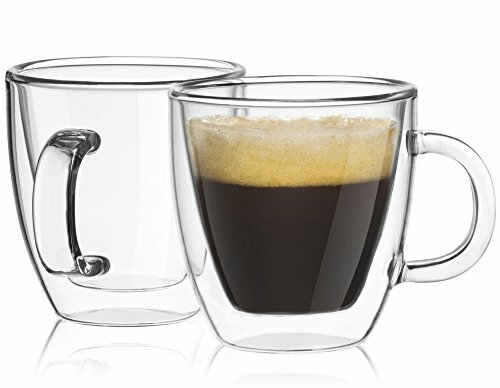 Again, these cups are designed to take a standard normale shot of espresso. The cups are made from sturdy, high-quality ceramic in a classic white, textureless finish. The material is safe for use in microwaves and dishwashers. This is a great budget-priced demitasse set that’s perfect for everyday use. Bodum is well-known as makers of high-quality, heat-resistant glassware. 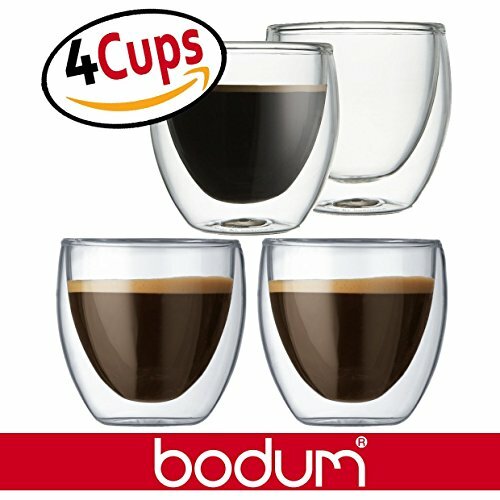 In addition to their range of milk frothers, teapots, and French presses, Bodum makes espresso cups. These double-wall demitasses are a massive nod to the dedicated espresso drinker. The borosilicate glass is designed to keep your drink hot longer, and the clever design includes a layer of air between the glass walls that prevent you from burning your fingers. The scratch-resistant cups are dishwasher and microwave safe, and can even be put in an oven up to 350oF (if you ever felt the need to do such a thing). These aren’t the cheapest demitasses out there. However, this set of four was individually hand-blown by artisans. So if you’re looking to teat yourself-give these a shot. 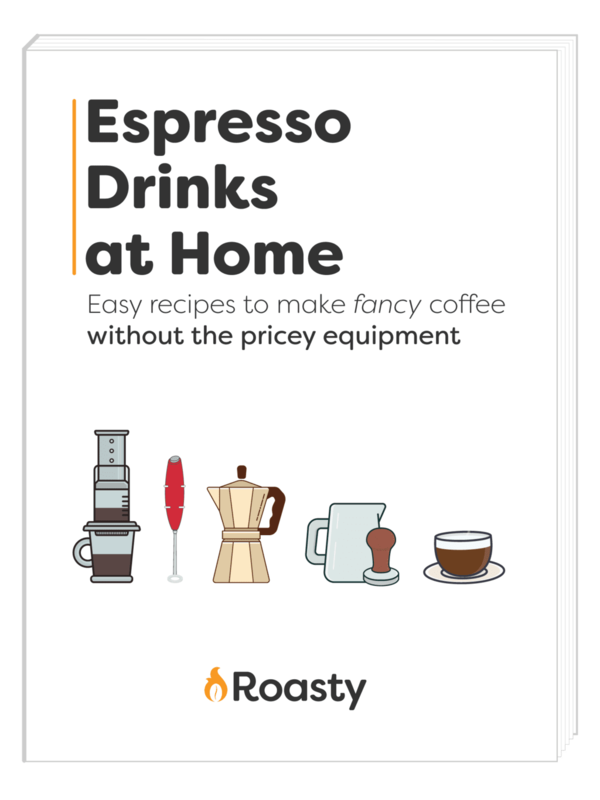 If you want to enjoy the quirky look of double-wall glass espresso demitasses without fearing that you’ll either drop the dang thing or burn your fingers, you might prefer JoyJolt’s offering. These espresso mugs/cups have handles. These cups have 5.4-fluid ounce capacity, making them ideal for those who like to enjoy a bigger Java jolt. There are two cups in the set, made from condensation-resistant borosilicate glass that keeps your shot hot and your fingers cool should they stray onto the body of the cup. For something a little more avant-garde, you could try Farnworth & Lloyd’s stainless steel demitasse set. 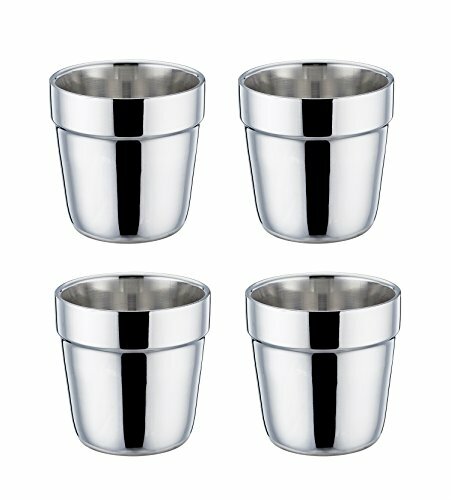 These cups comfortably accommodate a standard normale and are also designed with handles. So, although the makers insist that these cups keep the heat inside the drink so you won’t burn your fingers, you may feel more secure with a handle to hold. 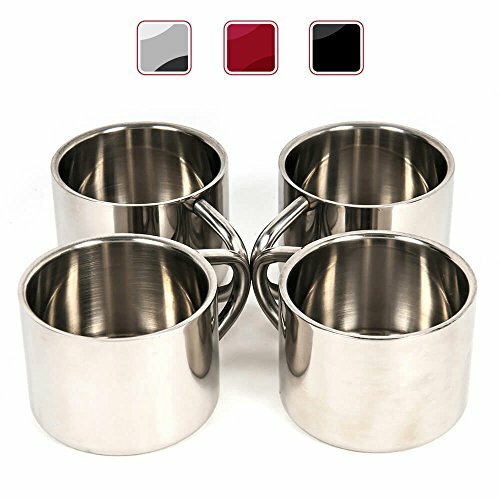 The set comes with a black, silver, or dark red finish to blend with your kitchen décor scheme. We particularly like TeamFar’s stainless steel coffee cups that come in a set of four. First off, the stylish design and mirror shine finish both look great. The cups are made from is BPA-free and non-toxic materials, so you won’t experience that unpleasant metallic taste. The cups have a double wall, keeping heat in while protecting your fingers from getting scorched. There’s also a rim on the cup to keep it from slipping from your hand. The 6-ounce capacity is perfect for larger shots and makes the cups versatile enough for use when making other drinks. The cups are also dishwasher safe and stackable for easy storage. So, that rounds up our best espresso cup review section. Now, let’s move on to look in more detail at how to choose your perfect demitasse. No-one likes a tepid shot. As most home baristas know, espresso gets cold really quickly. One reason for this rapid cooling is the low brewing temperature that’s used to preserve the flavor of the grind. The other reason for quick heat loss is the small volume of liquid in the cup. You can stop your shot from chilling too quickly by using a demitasse that has good thermal insulation qualities. Simple, right? Not exactly. Different materials lose heat at different rates. Okay, so what’s the best material to choose for your demitasse and why? Styrofoam cups will give your brew a foul, plastic taste. Not only that, polystyrene (that’s used to make Styrofoam) can cause cancer and other hideous health problems. So, let’s not even go there. The demitasse that will keep your shot hot for the longest time is a double-walled glass one. At the same time, your fingers will stay nice and cool. Cool! Now you’ve decided on the best material for your cups, and you’ve worked out what size demitasse you need, let’s look at a few other considerations that can be just as important. If you’re the kind of coffee drinker who likes to augment their espresso with sugar, or if you like to dunk a biscotti while savoring the coffee’s flavor, you’ll need saucers with your cups. Those of you who like a lungo beverage will need to look for a larger cup that has a handle. A larger cup will have a more consistent heat exchange and can become very hot, very quickly, hence the recommendation of a handle. Traditionalists will be unerringly drawn to a plain white, ceramic cup. In fact, that’s what you’ll usually have your espresso served in at your local coffee shop. However, if you like to have a set of crockery that matches your décor, especially when you’re entertaining, you can choose from solid-colored or patterned demitasses. This style of cup usually has a white interior, the idea being to show clearly the strength and depth of color of the shot within. Clear glass cups are perfect for showing off the drink they hold and can look particularly impressive if you enjoy a cold brew during the summer.